Pour vodka and soda into a mixing glass - stir. Drop cherry in bottom. Enjoy! Infusions are all the rage right now, and with good reason.This gorgeous pink martini features marshmallow infused vodka. Did someone say, yum? Infusing is basically chopping up an ingredient and macerating it in some alcohol (usually vodka, because it so seamlessly takes on other flavors). It's an excellent way to give a cocktail an impressive, personal twist using far less effort and time -- perfect for entertaining. And what's great about infusing your own spirits is that it can be done with so many different flavors: Strawberries, raspberries, lemon, chilies, cinnamon, marshmallows... Marshmallows? Yes, marshmallows. As in, marshmallow infused vodka! While fruits and spices may be the more traditional items used to gussy up vodka, there's actually a long tradition of flavoring liquor with confections. (Amaretto, for example, was originally flavored with almond-cookie dough, not almonds themselves.) And you'd be surprised at just how much sweet marshmallow flavor the vodka picks up, and how gently the marshmallow tempers the vodka's heat. The procedure to making marshmallow infused vodka could perhaps be easier, but I'm not sure how. 1) Place your marshmallows in a large, clean jar. For a faster infusion, cut up the marshmallows, if you bought the big guys...or save yourself the trouble and buy a bag of the minis. 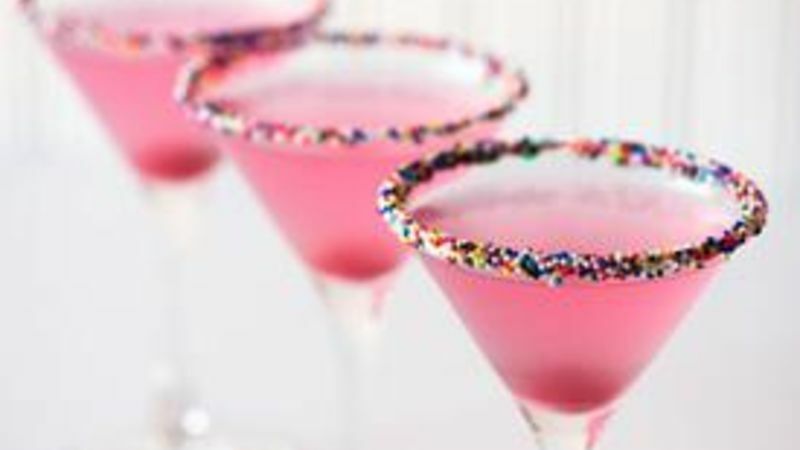 2) Place in a jar, pour in one bottle of the vodka of your choice (for this Cake-tini, naturally, we used cake flavored vodka. But really, there's no sense using anything very distinctive or pricey, even a plain vodka will make a nice marshmallow infused vodka), cover tightly, and let sit 24 hours. (Note: rinse out the vodka bottle and set it aside for use later in straining and storing.) 3) Strain the vodka through a double layer of dampened cheesecloth set in a straining device (a colander, a funnel, a kitchen strainer – whatever you need to get it back into the bottle). Dampening the cheesecloth in advance ensures that none of your precious vodka gets soaked up into it. I usually strain my vodka several times, rinsing out the cheesecloth between each round. There. That's it. You're done! For the cocktail, there's nothing more to be done but chill the vodka and pour into glass with a little cherry soda, garnishing (of course!) with a maraschino cherry for a delightful Marshmallow Cake-tini. (To add extra adorableness, add some sprinkles to the rim of the glass. Cake frosting helps to make the sprinkles stick!) For a martini, it's pretty soft and mild...like I said, the marshmallow’s mellow (or should that be 'mallow'? ), the vodka is a great deal, but for guests who like a longer drink, a higher ratio of cherry soda can be added for a longer, sweeter drink, over ice. Enjoy!